ID Tech SREDKey - Keypad and MSR, Track 3, AES Encryption, Enhanced Format, USB Keyboard, Black. 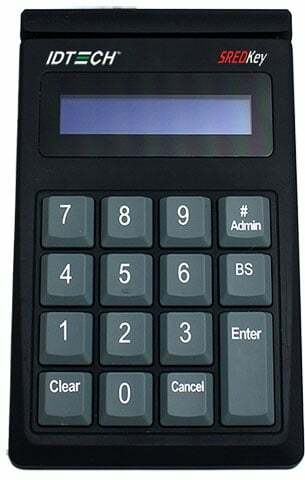 SREDKey is an encrypted key pad with an LCD and an encrypted MagStripe reader that offers retailers a complete and reliable security solution that meets the PCI-PTS certification. This intelligent reader delivers superior reading performance while encrypting sensitive MagStripe and keyed-in data that reduces the scope of PCI-DSS. The SREDKey ensures all data transactions are protected through secure point to point encryption reducing fraud and data compromises. The ID Tech IDSK-534833AEB is also known as IDTech	IDT-IDSK534833AEB	or IDSK534833AEB	.